The Kinkajou is a medium-sized arboreal mammal of the lowland forests of Central and South America. It is 40-60 cm in length, and in addition to its body length, it has a long, prehensile tail the same length as its body. Its entire body and tail are covered with dense, golden hair. It has a round face with a short muzzle, large, wide-set eyes and small, rounded ears. It has short legs for climbing trees. Kinkajous are very similar in appearance to their closely-related cousin, the Bushy-tailed Olingo (Bassaricyon gabbii); however, olingos lack a prehensile tail—kinkajous are the only New World carnivore with this feature. Although it may look a little bear-like, the Kinkajou is actually a member of the raccoon family, Procyonidae. They are also known as the “honey bear”, because they often raid beehives. Even though they are technically carnivores, they are mostly frugivorous, preferring to feed on fruits including figs, palm fruits, mangos and passion fruits. To help them feed, they have a long tongue (20 cm in length) and dexterous front paws. 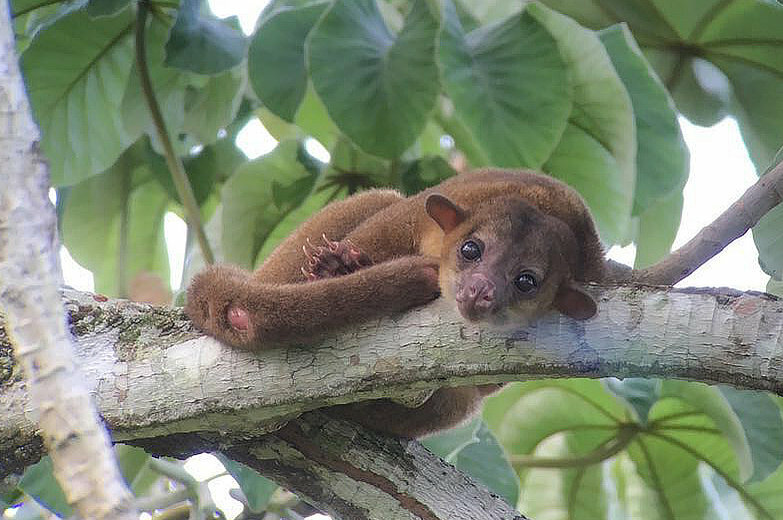 They are common in Panama, but due to their nocturnal and arboreal behavior, they are seldom seen. However, they make noisy movements through the trees, occasionally in pairs or small groups, and are very vocal—they have a wide range of whistles, barks, grunts and screams and have earned the nickname “la llorona” in Spanish, meaning “crying woman”. Kinkajous are often encountered on our night drives at the Canopy Tower. Confused yet? They may look a little bear-like, or perhaps even monkey-like due to their arboreal behavior, and were even classified as lemurs for a while!